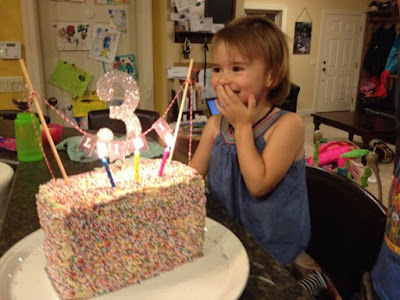 So, my middle child turned three earlier this month, and even though we just do family dinners for birthdays at this age, I wanted it to be special. When I showed her a Pinterest picture of a cake covered with sprinkles and her eyes lit up, I knew that this was the thing. All afternoon and evening of the big day, her whole face shone when she looked at the cake, and every picture is "marred" by her stealing tiny bits of sprinkles and putting them in her mouth. What's amazing about the sprinkle cake, aside from the sheer quantity of sprinkles and how easy it is to end up with tiny, sugary balls bouncing off of your tile in every direction, is that it's not like my kids are strangers to sprinkles. We put sprinkles on steamers for them at least a few times a week. I put sprinkles on their yogurt, sprinkles on our coconut fudge truffles, sprinkles on our hot chocolate. It would seem that familiarity has not bred contempt. In fact, quite the opposite: through consistent, delightful exposure, Lili's heart has been trained to appreciate -- probably much more than she would have without regular exposure - a cake covered with over a pound of sprinkles. We are people of the future. This world has been ravaged by sin, and we are grateful that it is not all there is. Eternal joy awaits. In the meanwhile, heaven is breaking through, sprinkle by sprinkle, giving us tastes of glory, encouraging us to press on, to develop appetites for what is truly good and deeply satisfying. This world is a training ground for our hearts to appreciate the overwhelming joy that is to come. You can't even imagine, but sometimes it's important to try. i don't frequent as much as i used to, but when i do, i am amazed how wise you are, Molly!